Back in February I posted a recipe for cow parsley soup. Cow parsley (Anthriscus sylvestris) is also known as ‘wild chervil’, and whilst I quite like it, I know isn’t for everyone. But the important thing to be aware of with cow parsley is that it can be mistaken for hemlock (Conium maculatum). Some of you might remember from history that the Greek philosopher Socrates was executed by consuming a hemlock derived drink – it’s highly poisonous so you need to get this right. I added a couple of photos and a few pointers on the differences between cow parsley and hemlock in the cow parsley post, but I didn’t add a lot of detail as I’ve never seen any hemlock near our woodland camp to get close ups. However, at the weekend we ran a Wild Foods course at Nethergong Campsite and there was loads of hemlock, growing alongside the cow parsley. So, here are some photos. They are subtly different shades of green – the hemlock is a little darker. Cow parsley has a matt finish whilst the hemlock has a slightly glossy sheen. Hemlock has finer leaves, more feathery in appearance. In this next photo cow parsley is again on the left and hemlock on the right. 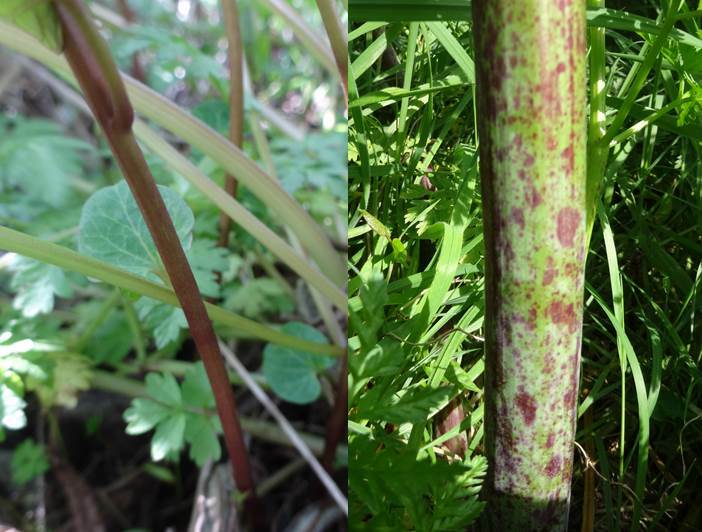 Whilst cow parsley often has a pinkish hue to the stem, hemlock has very distinctive purple blotches on a green stem. Make sure that you check the stem at ground level, this seems to be where the blotchiness often occurs. Cow parsley is slightly hairy, hemlock has smooth stems. 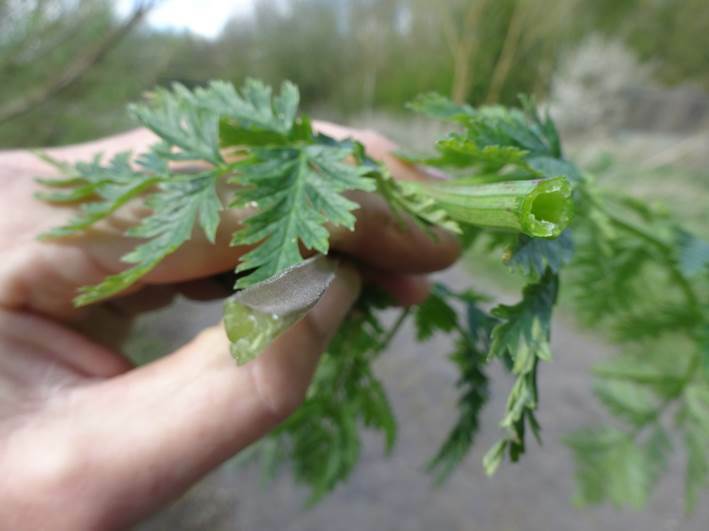 Cow parsley stems have a groove, a bit like celery, hemlock doesn’t have this. In this last photo you can see a cross section of the stems, again cow parsley on the left and hemlock on the right. Note, the photo isn’t of the main stems, but from stems coming off the main stem. Here the important thing to notice is the shape of the stems. Cow parsley is triangular whilst hemlock is round and hollow. So this is difficult to get across on a blog post, but smell can help here as well. Cow parsley, I think, has a pleasant smell (a bit of a cross between parsley and aniseed), whilst hemlock really doesn’t! Unless you are absolutely certain you know what it is, don’t eat any foraged plants. Thanks for this info!!!! Very detailed and useful. I just read an erroneous description of hemlock and cow parsley and began to doubt myself. You have reassured me. I was getting concerned! Thanks Gary. Glad to be of help Paul. Sorry but I’m still confused. I’ve found what I think is cow parsley based on this post but the stem is hollow. It’s quite a young stem. Still not certain enough to risk it! Hi Tamara, you’ve done the right thing, if you’re not sure, don’t eat it. Thank you, this is so much clearer than my flower book ! Very helpful. It’s really nice to be able to identify plants on a countreyside walk. Hi I’m not certain, but have you got the stems the wrong way round in the description. 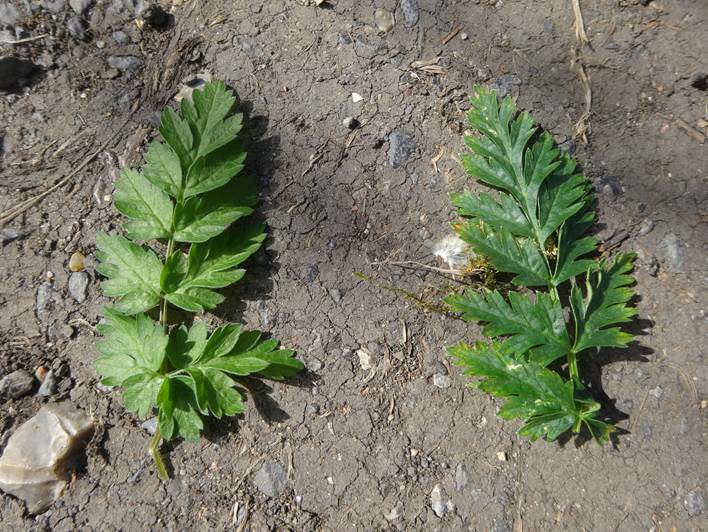 The one on the right certainly looks ridged, like cow parsley. Thank you. Hi, they’re the right way around. Cow parsley is more triangular in shape, hemlock is round. Interesting and helpful – many thanks! Very clear on the differences — thank you for posting this! Can you make wine from cow parsley. Gary, this is really helpful as ever. Socrates wasn’t executed. He was convicted of misguiding the youth by asking them questions and encouraging them to mock authority. He was invited to suggest his own sanction and suggested that he be kept in luxury in Athens and his students could come to him and continue to learn philosophy. This offer was rejected by the court so he effectively chose himself to drink the hemlock. He preferred to die than to reject his values.